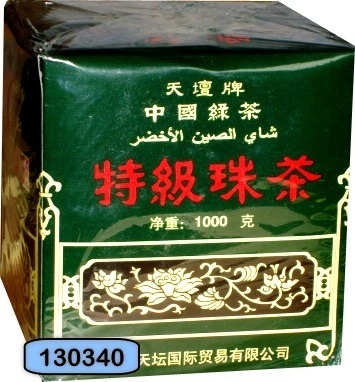 Gunpowder tea is a form of green Chinese tea produced in Zhejiang Province of China in which each leaf has been rolled into a small round pellet. It is believed to take its English name from the fact that the tea resembles blackpowder grains. This rolling method of shaping tea is most often applied either to dried green tea (the most commonly encountered variety outside China) or Oolong tea. Rolling renders the leaves less susceptible to physical damage and breakage and allows them to retain more of their flavor and aroma. In addition, it allows certain types of oolong teas to be aged for decades if they are cared for by being occasionally roasted.